KANSAS CITY, Mo. 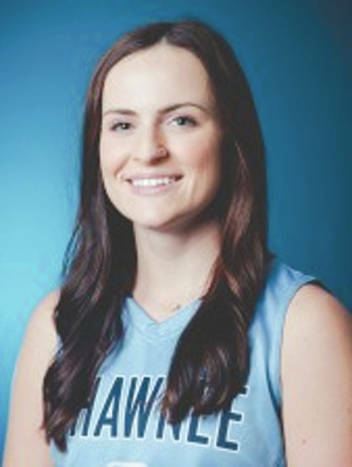 — Greeneview High School graduate Ashton Lovely, now a senior at Shawnee State University in Portsmouth, was named a National Association of Inercollegiate Athletics (NAIA) All-American on March 22. Lovely, who was named to the NAIA All-American Third team, was the only player from Ohio to receive All-American status. The nation’s leading freethrow shooter at 92 percent (81 of 88), Lovely was second in the Mid-South Conference in points per game (14.0) and made three-pointers per game (2.0). Shawnee State participated in the NAIA Division I women’s national championship tournament in Billings, Montana. It was Shawnee State’s ninth consecutive season in the NAIA tournament. A No. 4 seed, the Bears advanced to the tourney’s Sweet 16 before falling to Clark University (Iowa), 71-68.